More than half of the U.S. Navy’s aircraft can’t fly because there isn’t enough money to fix them, Defense News reports. Aircraft maintenance might not sound as impressive as tons of pointless new ships, but, there it is. 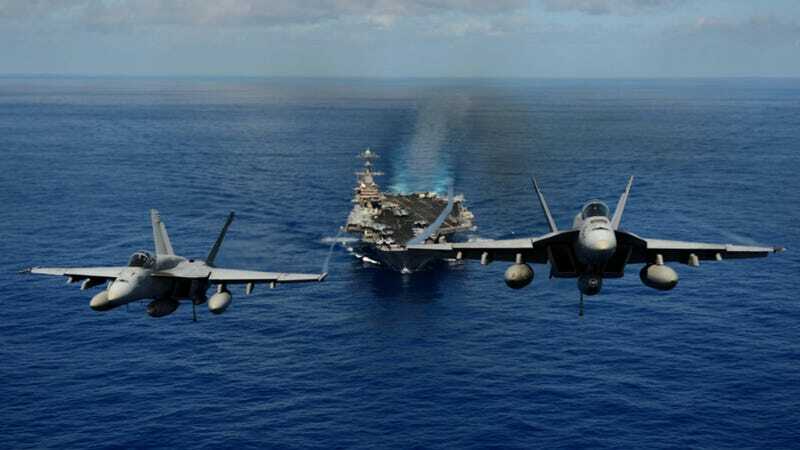 According to the Navy, 53 percent of all Navy aircraft can’t fly — about 1,700 combat aircraft, patrol, and transport planes and helicopters. Not all are due to budget problems — at any given time, about one-fourth to one-third of aircraft are out of service for regular maintenance. But the 53 percent figure represents about twice the historic norm. But aircraft aren’t the only victims of budget issues. The Navy’s fleet has a backlog of vessels needing repairs. Every carrier has run long for at least three years and some submarines have been out of service for four years or longer. The USS Boise, a Los Angeles-class attack sub, has lost its diving certification and cannot operate until it undergoes maintenance. Five more subs will face a similar fate by the end of the year, if more money is not available, Navy officials told Defense News. The money shortage is not just impacting ships and aircraft. The Navy lacks funds to move service members and their family members around for assignment changes. The Navy also needs $440 million to pay sailors. Fifteen percent of its shore facilities are in need of repair, demolition or replacement, the report said. No aircraft, and a carrier just becomes another floating bathtub.